Oak Valley Hospital is dedicated to providing professional patient care in a safe and comfortable environment. We know you want quality outcomes, access to world class certified physicians and the latest advancements in treatment and technology. Though nobody wants to be hospitalized, here at Oak Valley we will provide for your wellness and comfort. 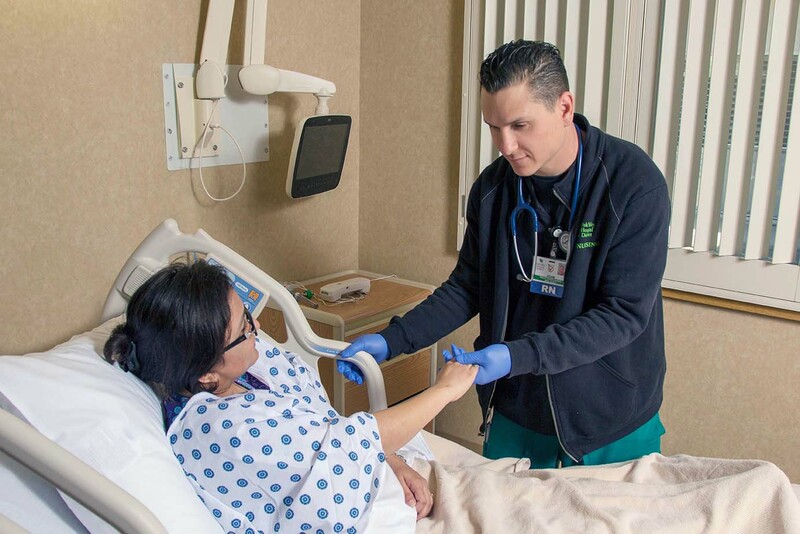 Our Medical/Surgical Department nursing staff are certified in Advanced Cardiac Life Support (ACLS), Basic Life Support (BLS) and Pediatric Advanced Life Support (PALS). With two pediatricians in addition to our other local community physicians we are able to provide healthcare to patients aged from the very young to geriatrics. For those who lack a Primary Care Provider we offer Hospitalist services, a physician who is dedicated to caring for our in-patients 24 hours a day, 7 days a week. Our newest leading-age telemetry system provides the technology to allow staff to continuously monitor patients’ cardiac status remotely. All 24 of our Medical/Surgical Department hospital beds are designed to provide comfort without noise. Each bed has its own flat screen television, so you can enjoy your shows while healing.